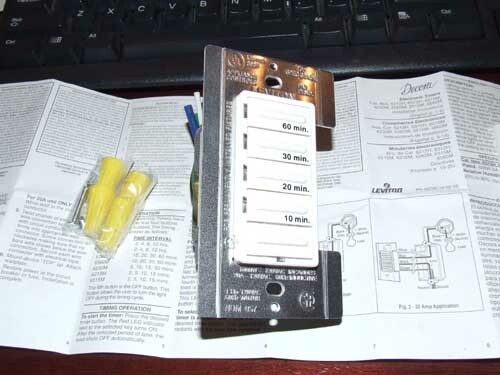 Yesterday I received the three Leviton 6260M electronic timer switches that I ordered for the bath fans. These switches allow you to choose pre-set times of 10 min., 20 min., 30 min., and 60 mins. You can buy these dimmers from Amazon, Leviton Decora 60-30-20-10 Preset Minute Electronic Timer. I plan on installing them this weekend in each of the three bathrooms. 1. Connect the green wire to the ground. 2. 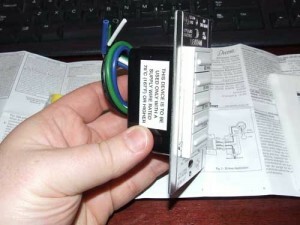 Connect the black wire to the line voltage. 3. Connect the blue wire to the hot wire of the fixture. 4. Connect the white wire to all of the neutrals. I will do a post this weekend on how to wire one of these up. The one problem I can see is the device is fairly large so fitting all the wires, wire nuts and device into the box will most likely be a HUGE challenge. See my post, How To Install A Leviton 6260M Electronic Timer Switch, on how I installed these new timer switches.